Any plant with the epithet medusa on its label has my immediate attention. Medusa is a name that promises weirdness--fringe, hairs, snaky appendages-- something exceptional. 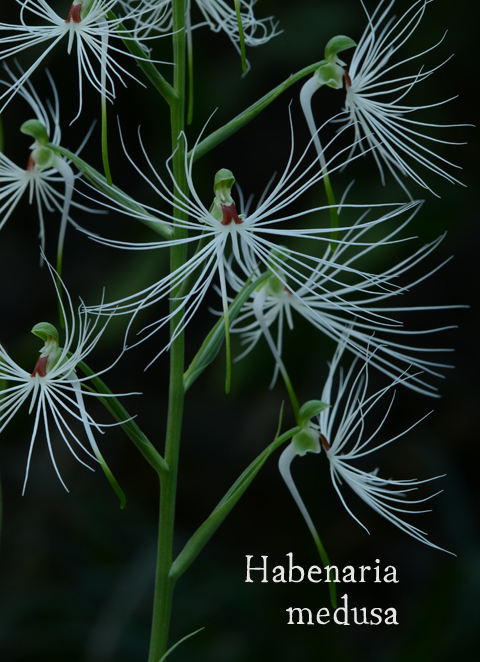 Habenaria medusa flowers every August in our greenhouses, and it is exceptional, and weird, but without the scariness that the name suggests. The flower's lip has three lobes. The two side lobes are deeply incised and look like fluttery fringe. 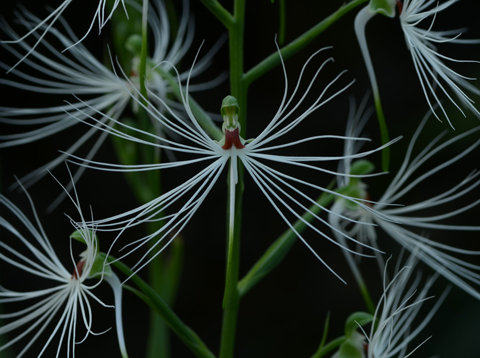 Each flower has a long spur. You might think that something so ethereal must be difficult to grow. Not true. It's actually pretty foolproof if you can remember to ease off the watering for a couple of months after the flowers finish. By then the plant has enough reserve stored underground to withstand the seasonal drought that it would receive annually in its native grasslands-- usually lasting several months. In the greenhouse we reduce the frequency of watering from about every four days to about every ten days while the plants are leafless. Our cue to resume frequent watering is the emergence of the new leafy shoot. Absolutely fascinating! Thanks for posting, Becky...I like this orchid a LOT! It's amazing how much one can miss between visits--and just how much one can see when visiting very frequently.